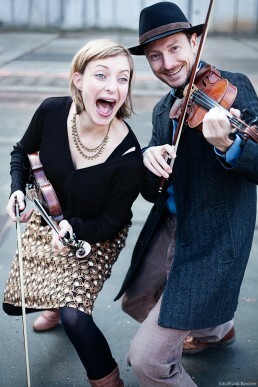 Azind is a traditional klezmer duo with my wife Alina Bauer. Originally, we recorded this music to celebrate the birth of our first child, but we decided to start to play concerts soon after he was born. There is a strange but powerful energy in playing music professionally with the person you love, and for quite a while, we avoided doing it mostly. I hope you will agree that it is a good thing that we decided to change that. 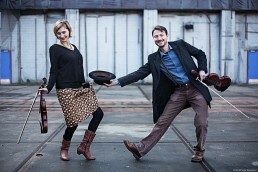 Azind is performing traditional klezmer pieces in a traditional style, in the most sober of duo’s: two violins, a context that allows the music to speak for itself in a powerful way (please do not look up the article called “On Letting The Music Speak For Itself” by Richard Taruskin). Ok, I admit, I also play accordion sometimes.